Coastal spinner dolphins in Hawaii, and elsewhere in the world, rely on sheltered bays for rest. These inshore locations provide an opportunity for dolphins to recover energetically and cognitively during daylight hours after extended nighttime foraging bouts, while minimizing predation risk. This behavioral trait often beings them into close contact with humans involved in dolphin-based tourism and, in many cases, the resulting interactions disrupt dolphin rest. Almost all animals need sleep, and spinner dolphins are no exception to this rule. The picture included below really captures the intensity of these interactions, and illustrates why we need to think very carefully about how much human attention these animals can sustain. Our latest paper, published in the Open Access journal PLoS One, provides the first quantitative assessment of spinner dolphin resting habitat in the main Hawaiian Islands. It has been common knowledge that spinners use sheltered bays with sandy bottoms since Norris first studied this species in the wild, but Norris’ original hypotheses about what constitutes quality resting habitat had never been formally investigated. To get at these relationships, Lesley Thorne (who is now installed at Stony Brook University but conducted the majority of the work as a side project while doing her PhD here at Duke) and our co-authors compiled a huge history of spinner dolphin sightings and used them in a Maximum Entropy Modeling exercise. This technique can produce habitat models for a species based on presence only records – avoiding the need for standardized surveys and data on where species are not found. This is a powerful technique if you want to collate sightings from a variety of sources, many of which come without any measures of survey effort. The resulting models are particularly timely, as NOAA is in the process of developing a series of time/area closures to help reduce harmful interactions amongst dolphins and people in 4 resting bays. The modeling exercise indicates that these 4 bays are indeed excellent resting habitat for spinners, which should help bolster arguments to enact these restrictions in the near future. Perhaps most importantly, the paper reveals that not all bays in Hawaii are prime real estate for resting spinners. The idea that animals can simply adjust their distributions to tourism pressure should be put to bed. 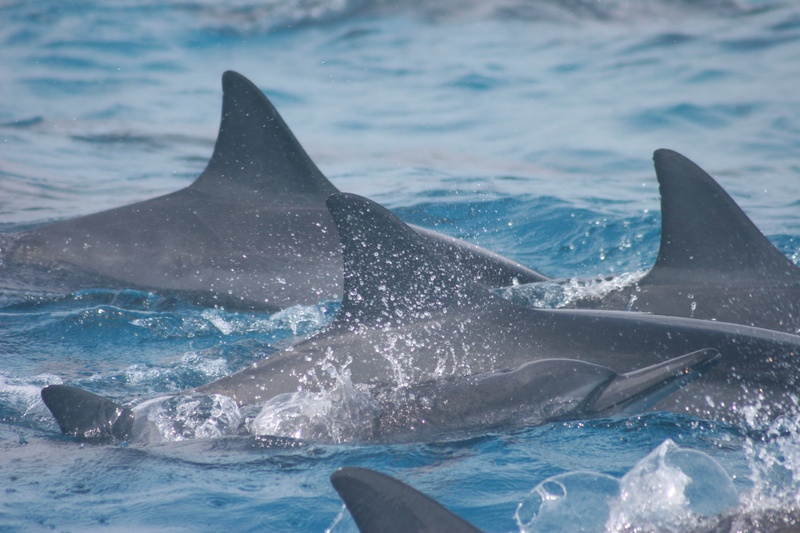 Not all bays are created equal when it comes to resting habitat for these dolphins, and this provides important information for managing human effects on the species and some context for what limits population growth in coastal spinner dolphins. The paper is available to everyone here: http://www.plosone.org/article/info%3Adoi%2F10.1371%2Fjournal.pone.0043167. I love open access! Congrats to Lesley and the rest of our co-authors on getting this paper out, it is an important step forward for spinner dolphin science and management in Hawaii. The Nicholas School has a nice story about the paper on their website here.